Coffee Trail - Counting Stars, Reaching Delphi .✫*ﾟ･ﾟ｡.★.*｡･ﾟ✫*. : Traffic Signals, Is It F1 Again? Today I am home again and up early to see the sights and hear the city before the honking of cars invade my ears. This walk is just as characteristic as the previous one. My pace is slow, so stay with me; it’s Sunday. Enjoy your coffee; there are just so many flavours to savour. It’s not F1 or GP motor day, so there is really no reason to rush. Before we begin, let’s get energised. Backward and forward bend, roll your hips, stretch upwards. We are ready. 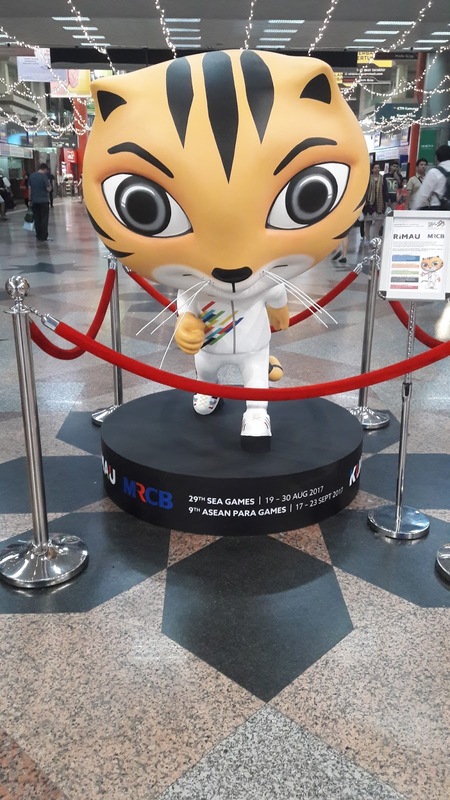 Now, meet Rimau, our mascot for the 29th South East Asia (SEA) Games and 9th ASEAN Para Games which have been held here recently. He is the Malayan Tiger, an athlete himself who symbolises Respect, Integrity, Move, Attitude and Unity among the participating countries and athletes. The SEA Games is a biennial sporting event involving eleven countries from South East Asia (Indonesia, Cambodia, Brunei, Laos, Malaysia, Myanmar, Philippines, Singapore, Thailand, Timor-Leste, and Vietnam). During my commute from work a week earlier, I met Alex, a Malaysian who had just flown in from Sipadan Sabah where he works. He was a volunteer for the Para Games and he shared interesting stories and experiences leading up to the event. I say to Alex and all the rest of the volunteers for both games – well done! The Games were amazing, and you guys made it happen! Go Rimau, Go Go Go! The SEA Games is a biennial sporting event involving 11 countries from South East Asia (Indonesia, Cambodia, Brunei, Laos, Malaysia, Myanmar, Philippines, Singapore, Thailand, Timor-Leste, Vietnam). During my commute from work a week earlier, I met Alex, a Malaysian who had just flown in from Sipadan Sabah where he works. He was a volunteer for the Para Games and he shared interesting stories and experiences leading up to the event. Alex and all the rest of the volunteers for both the games – well done, the Games was amazing, and you guys made it happen! I am all warmed up, filled with that super Rimau energy. I hop on a local bus heading to Pasar Seni LRT Station. 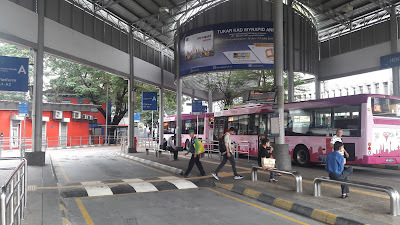 This area is what was once known as the Klang bus stop area, a place the SriJaya/IntraKota/Kee Hup Omni buses and pink mini buses (buses from yester-years) used as a hub. The Klang Bus Station closed in 2011 to make way for the newly opened Pasar Seni underground MRT station. Just outside the LRT station is a small waiting area for a few designated buses to pick up and drop off passengers. One of them is the GoKL bus service. This is an incredible service initiated by the local government to improve the quality of public transportation in KL within the central business district. And guess what? The purple buses you see in the next picture are free for commuters. I would like to take the bus, but it can wait until another time. My walk continues. I am on Jalan Tun HS Lee. This street is a long and historic one. Its presence is often overshadowed by the more popular Petaling Street (China Town). The street was originally called High Street, changed to be called Jalan Bandar, and then to what it is known as today. I didn’t count, but read that there are over 200 old shop houses, preserved as part of the heritage, on this street. Some of them are better preserved than others. Many of them today are renovated and used as cafes and budget hotels. Well-established banks have also marked their presence along this street. The Maha Mariamman temple was built in 1873. 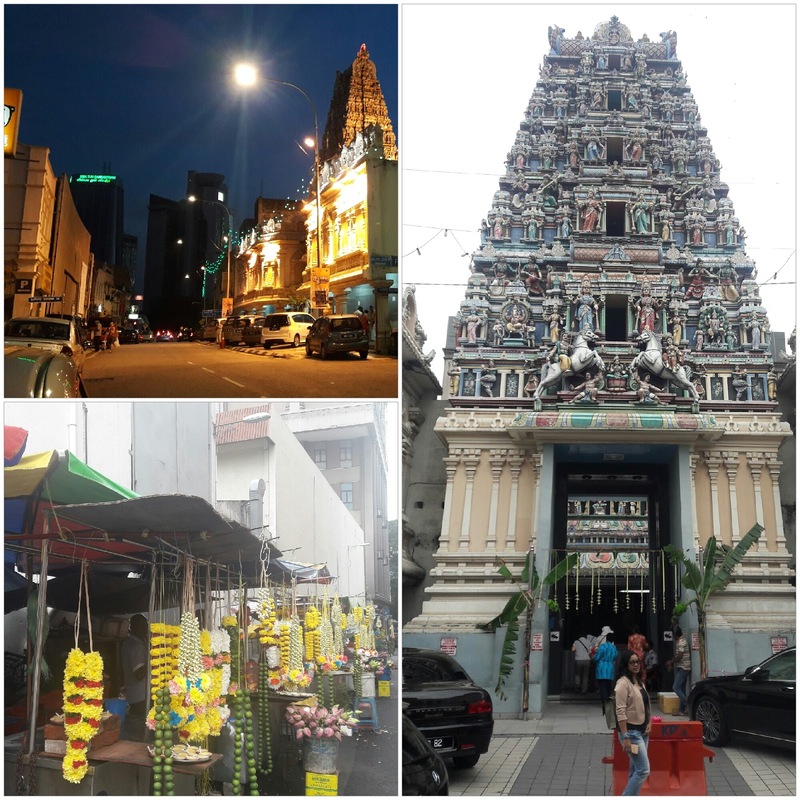 This is the oldest Hindu temple in Kuala Lumpur. The temple is open for all, any time of the year. It gets a tad bit crowded during Thaipusam, an annual Hindu festival, when thousands of pilgrims who follow the Silver Chariot procession up to Batu Caves begin the journey here. Today, the entrance is decorated with two plantain trees indicating there is a special prayer and all are welcome. The chiming of bells have started, meaning the homam is about to start. Outside, the flower stall vendors are preparing the jasmine garlands for the poojas. I have also included some night shots on this page. I hear the mantras being recited. It’s time for me to go in. Guan Di Temple is a beautiful deep-red Taoist temple, less than 50 meters away from The Maha Mariamman temple. 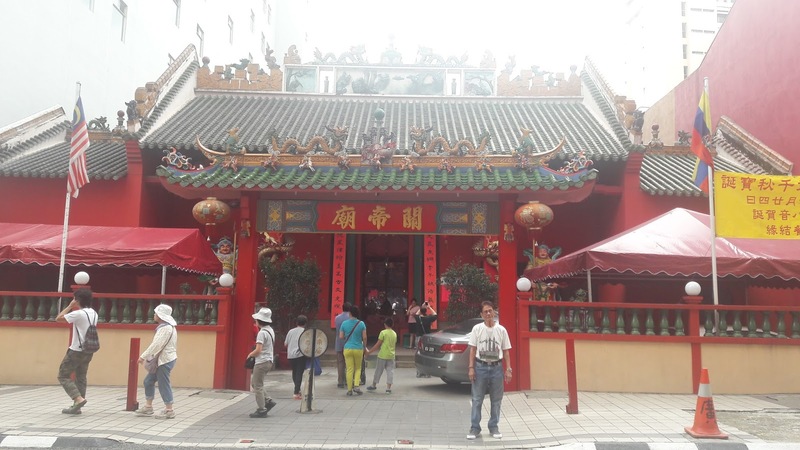 It is believed that the copper Guan Dao (Chinese pole weapon) here has special powers to bless and protect a person who touches it or to turn luck around. Well, this can only mean one thing. I need all the good luck I can get so I am going in. From where I stand, I see the coils of incense smoke puffing through the door and along with it, a soft fragrance that tickles my nose buds. The temple was built in 1887. It opens at 7 am, and stays open until 7 pm. Next, I pass by the famous Petaling Street, or what you now fondly know as China Town. I was quite surprised to see some stalls opened early for business. Louis Vuitton, Rolex watches, Nike shoes, you name it, and they have it😊. The catch is, these are all counterfeit, but look close to the real thing. The challenge is to make sure you don’t buy something that looks fake and to get it at the lowest possible price, even if it means having to lose your voice in the process. I remember proudly showing off my Ralph Lauren watch once, and my friend flashed out her original in response. Oops! Well what can I say? I was young and naive then. Today, I am happy with just the functional basics – it just needs to do the job sweetheart; just do your job and not be too pretentious. China Town at night is more entertaining. 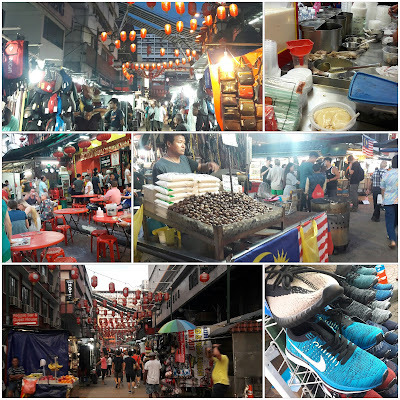 With the lights out, the haggling intensifies, serious negotiations start, and you can begin feeling the energy of China Town as the ringgits exchange hands and the goods are handed over. Yay! A Michael Kors. 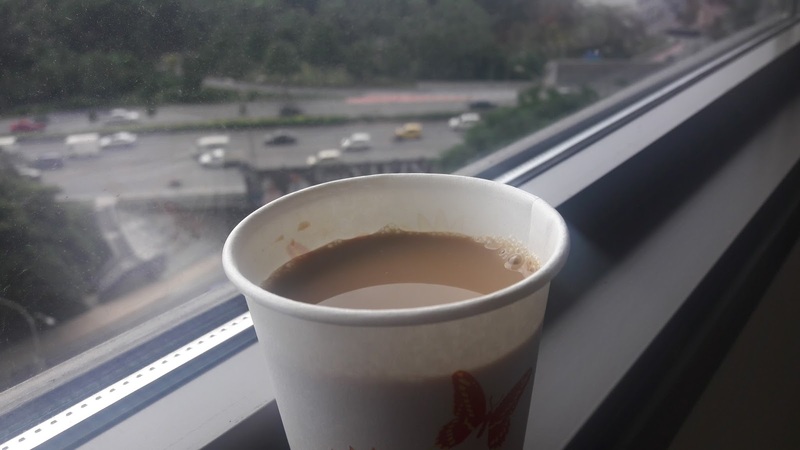 When here, try the local food – you’ll get the best Soya Bean milk in town (trust me, its original–no fake beans used), freshly roasted chestnuts, and seasonal fruits. You can also find local restaurants serving freshly cooked dishes. China town has been the hub of traditional florists for a long time. 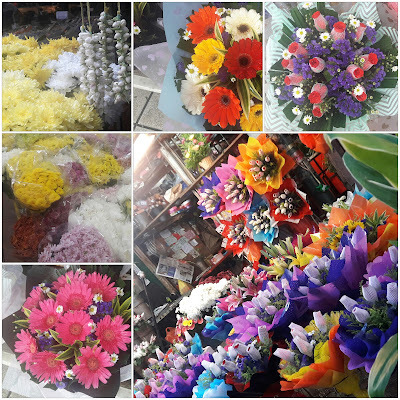 I am transported back to my school years when my classmates and I visited every florist in China Town and Pudu to search out roses for the school’s rose-request fundraising project. That was a lot of work, but it sure was fun. The sight of roses makes one smile and yet that same rose could stir up strange and interesting tales after. Thank you for the bunch 💛💗💚. Well, if you are here and still don’t know what to get, pick up the T-shirts–they are a best seller. Most importantly - bargain😉. At the end of China Town, at the intersection, you see more heritage buildings. You can see these buildings in the next picture; there is another tall building that looks like a number ‘1’. That’s the Maybank Head Office, a place where I spent five years of my COBOL days. It was built in the 80s and each time I had passed by this place on my way to school, I made a wish to work here someday. Wishes do come true (given the right ingredient). 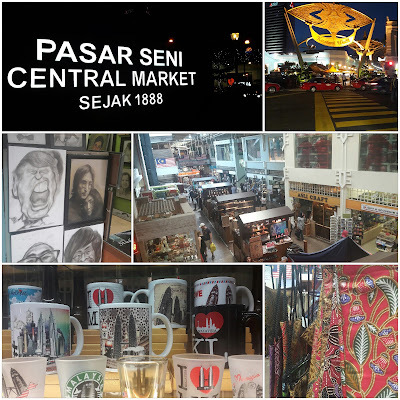 I continued onwards to Central Market. Up until the 1980s this was a local wet and dry market. It was the biggest market in Kuala Lumpur then. Today it is a centre for culture, arts and craft. This is THE place to get a variety of Malaysian souvenirs all under one roof. On Saturdays, there are cultural shows and some days there are outdoor stage performances. Kasturi Walk is one of the more recent and welcomed extensions to the market area. You get a better glimpse of the Daya Bumi building from here. What shall I get now? After seeing all that impressive handwork, it’s time to make a move, this time passing through another old heritage – Medan Pasar via Bangkok Bank area (Bangkok Bank had recently shifted its operations to another location) or Jalan Silang. This area was once popular for textile and goldsmith industry and you can still see some of these today. Jalan Silang was also the central pickup and drop-off point for the notorious pink mini buses before they were replaced with the safer options. One of these buses had hit me in my shoulder then, and ouch! That's why I have a reason to call them notorious! My favourite cafe I mentioned earlier this year, Mcgoo Deli is just around the corner, but it will have to wait for another time. Right now my tummy is calling for a yummy banana leaf lunch. Before that – let’s see a famous mosque – The Masjid Jamek (Sultan Abdul Samad Jamek Mosque). This pink and white structured mosque is one of the oldest in the city. It is located at the confluence of the Klang and Gombak Rivers. The mosque was designed by Hubback, the designer who had also designed the Central railway station, Majestic Hotel and the Bangunan Abdul Samad. The design is Moorish or Mogul. The mosque was officially opened in 1909. 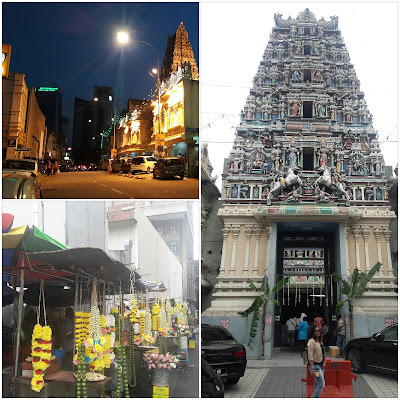 My walk today ends at the original Little India – this is Leboh Ampang. 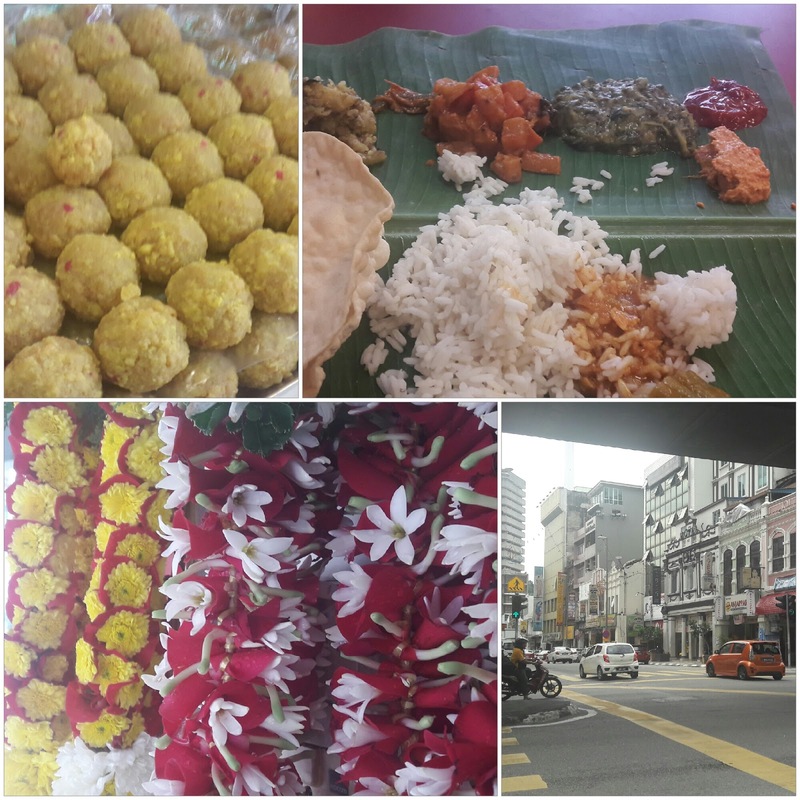 Come here for good vegetarian banana leaf lunch meals. The choices are plenty. You can end with a nice glass of Indian coffee. I was super-stuffed so I skipped the coffee. Leboh Ampang was made famous by the Chettiar community who established their money lending businesses here. Along with that came other small business setups. 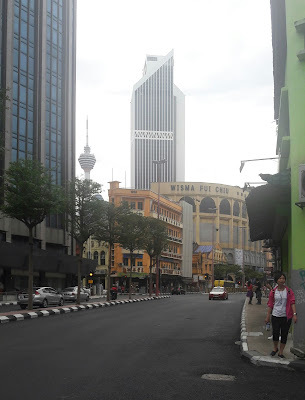 This area (old Kuala Lumpur) is not only the confluence of the two famous rivers, but also the confluence of the traditional and modern financial institutions. The buildings here are part of the preserved heritage; you’ll find many of them painted with vibrant colours. I am at a crossroads, deciding where the next place should be. I walk up a bit more, onto Jalan Ampang where a famous Tamil Press head office once stood. Tamil Nesan was established in 1924. Many memories I have here, good ones. I had a personal and special bond with its founder and with a few close relations who dedicated most of their working lives here to bring this paper to the readers. I head back to that crossroad. Lights change, and more decisions are waiting to be made. I am back. My coffee is an Indian one, a takeaway from nearby. It’s an I-am-whom-I-am-coffee. So, I didn’t need to add any enhancer. It is a perfect start to the new week. Have a great week ahead!